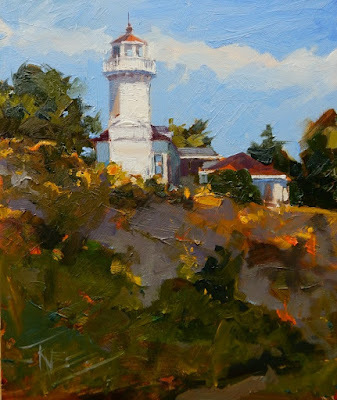 My last post talked a little about one of my favorite painting spots, Port Townsend. I painted this on the same day as the painting in my last post. There were problems with the plein air painting and I fixed it up in the studio. That is often the case....and hey! that's okay! 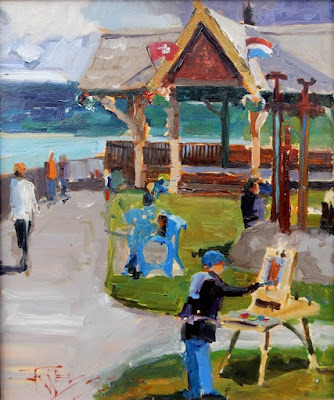 ...whatever makes a great painting....IF, however, you are in a competition, make sure you know the rules on what constitutes a plein air painting in that particular competition....They vary! 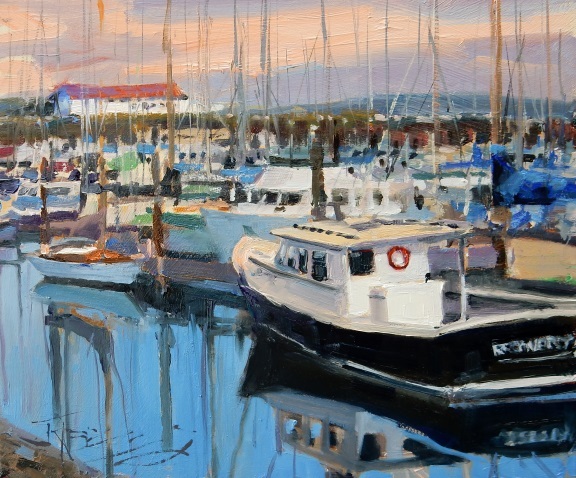 When I head out to paint without a plan of where to go I often find myself at the Port Townsend boatyard. Not only do they have the best working shipyard, there are also marinas stretched along the waterfront . These days mixed among the warehouses and boat-building workshops are a bunch of eclectic coffee houses and restaurants. A perfect place to find a scene to paint! 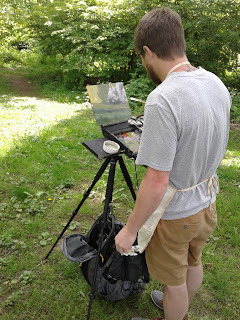 My son Maury has been coming along on many outings to paint with me....He is getting really good and I love spending time with him doing what we both enjoy. He works for a game design company in Kirkland WA and mostly does digital artwork but also loves to get out and paint from life. You can check out his website here....don't forget to leave an encouraging comment! I brought two of these 10x20 panels with me to paint at the Seattle Arboretum. The tall trees and shadowed paths were perfect for a tall skinny format. I added the strollers using my phone which I kept handy while painting the main composition in case anyone walked down this path. I took a lot of photos but these two romantics seemed perfect for the scene. See my previous post for how I composed the other 10x20. I plan on saving these two paintings done at the Seattle Arboretum to inform larger studio paintings which I will enter in PAWA's end of the year exhibition at the American Art Co. in Tacoma, Wa . 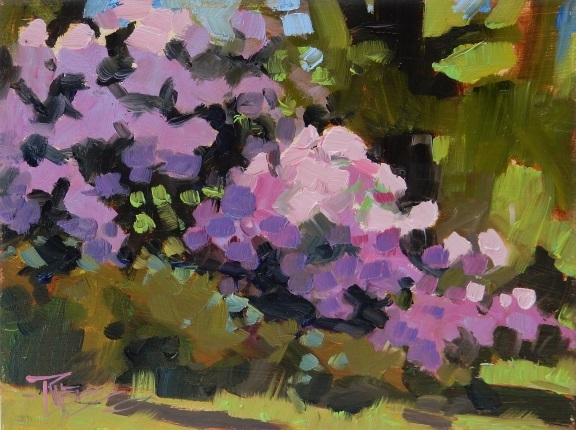 Earlier this year when the rhododendrons were in full, spectacular bloom The Plein Air Washington Artists met at the Seattle Arboretum. Maury picked me up at the ferry and we went over to join the gang. We were glad we went! Wow! What a show! I set up along the Rhodie path and pulled out this long skinny panel which worked great for composing the scene before me. I have been making these long format panels for awhile now. They are the best option for a lot of compositional choices. I buy a panel at home depot that is used for cheap bathrooms. It is 1/8 inch thick, has melamine on one side and unfinished masonite on the other, 4x8 ft sheet. I cut it up into the sizes I want and then gesso the unfinished side. I am currently using a Utrecht Gesso which only needs two coats to cover. You may even need to thin it a bit. 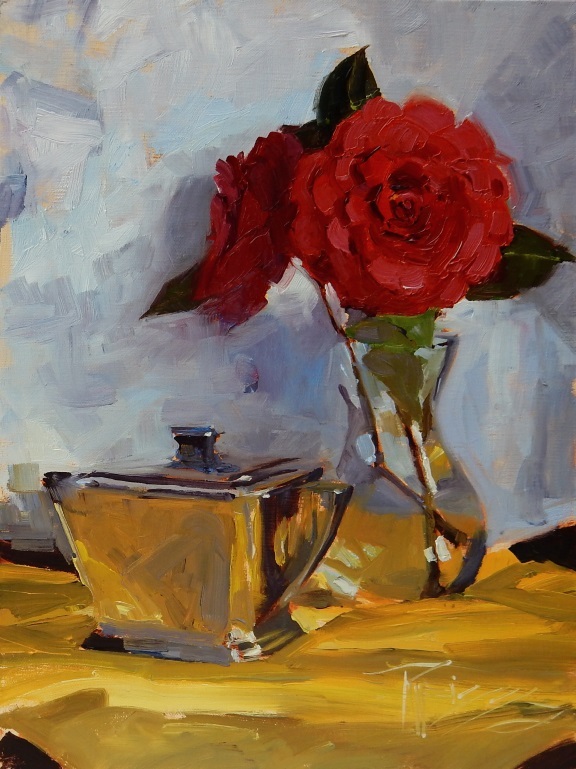 My painting " Camillias with Sugar Bowl" has been accepted into the 19th Annual AIS National Juried Exhibition. Somehow I hope to make it to this show which will be held at the Peninsula School of Art in Door County Wisconsin , September 27th. I have been accepted into the First Annual Central City Plein Air Festival, which takes place in Central City , Colorado, September 28-30, 2018 .......So I guess I wont be attending the AIS show!! 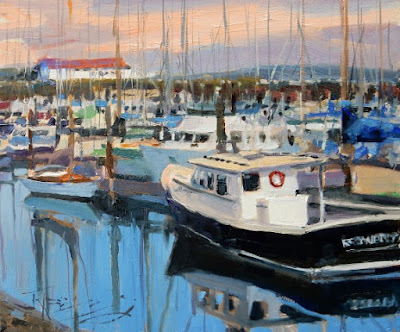 I recently joined the Peninsula Music and Arts Society of Poulsbo. 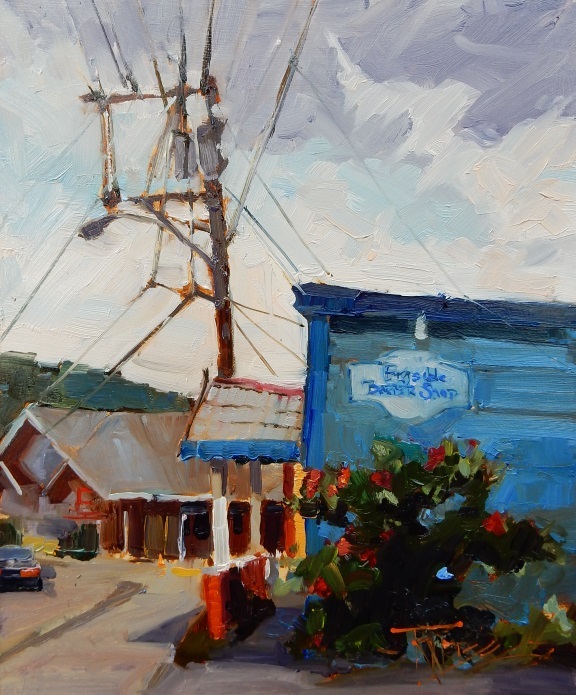 They mostly raise funds for scholarships to help aspiring young artists in our area. Part of the fundraising the last few years has been a plein air painting event in Poulsbo. It started off small but is growing each year. 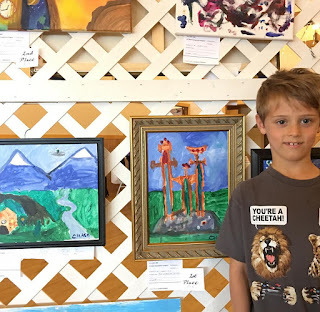 This year I entered my grandson Chase who, at eight years old, is also an aspiring young artist. 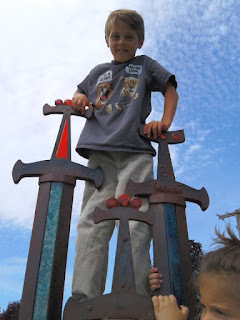 He decided to paint the Guardian Stone, a cool sculpture in Poulsbo's waterfront park that has three swords planted in a big rock. Chase's parents are both educators in the public schools and their philosophy of going to new places and trying new things is paying off. Chase had no hesitation entering this competition and following through. He completed three paintings in two days. As you can see in this picture Chase is taking this competition very seriously! While I am in the background looking at something on my phone he is concentrating on producing a masterpiece of artwork. Chase with his painting "The Guardian Stone"
Others thought it was good too! Many people stopped to encourage him. When we finally turned our paintings in at the end of the day, the Judge of Awards, Max Hazlette, awarded Chase's painting First Place in his age category!...and then handed him a check for $150! The look on his face was priceless as he received the award. 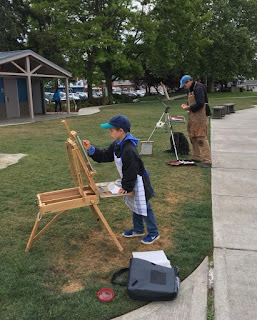 Another plein air artist is born! I have painted the tulips in Skagit county a lot ! These days I look for other views but those rows of color draw you in and it is almost impossible not to paint them. This is the back side of Roozengaarde Farm . The design element of rows of anything going into the distance is a good tool to bring the viewer into a scene. 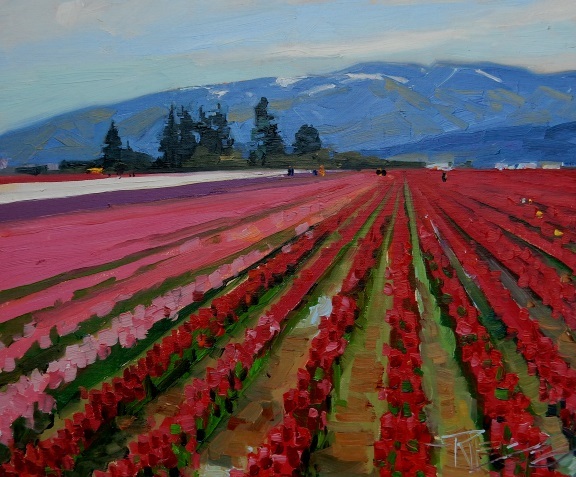 The only problem, especially with tulip fields, is the over use of that element in many paintings. I think this is a good painting just a bit cliche. That being said, if you have been to the fields of color, this would be a good memory of your visit!